Somaliland Mission to the United Kingdom released press-Statament that informed the Somaliland citizens with residency rights in the UK that,following constant reports of border-related difficulties involving their travel into and out of the UK,the Home Office has introduced interim measures to address these difficulties.These measures mainly apply to family reunion cases and Somaliland students studying in the UK when they go back to Somaliland and intend to return to the UK.According Somaliland Mission to the UK and the Commonwealth . The Somaliland Mission to the United Kingdom is pleased to inform Somaliland citizens with residency rights in the UK that,following constant reports of border-related difficulties involving their travel into and out of the UK,the Home Office has introduced interim measures to address these difficulties.These measures mainly apply to family reunion cases and Somaliland students studying in the UK when they go back to Somaliland and intend to return to the UK. 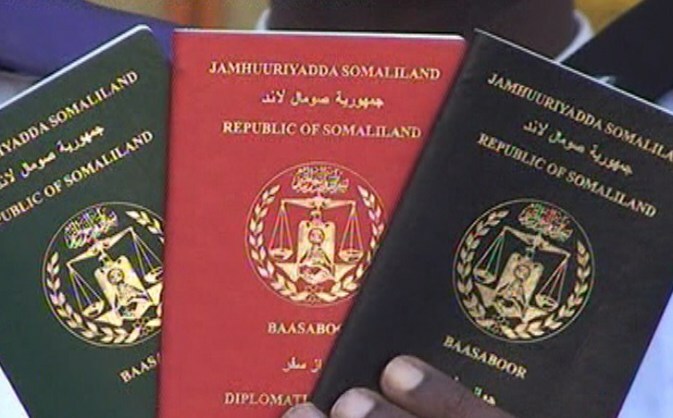 What this means is that,in the short term and effective immediately,Somaliland citizens with residency rights in the UK will now be permitted to enter the UK when they’re back from Somaliland by presenting a combination of two travel and identification documents at the border entry point: (1) a valid UK issued biometric residence permiVcard,and (2) their Somaliland passport.Previously,this combination was found to be insufficient for guaranteeing entry into the UK, despite the official right to residence of this group of Somaliland passport holders. As indicated,this arrangement is an interim (temporary) one,and the Home Office is currently exploring longer-term solutions. 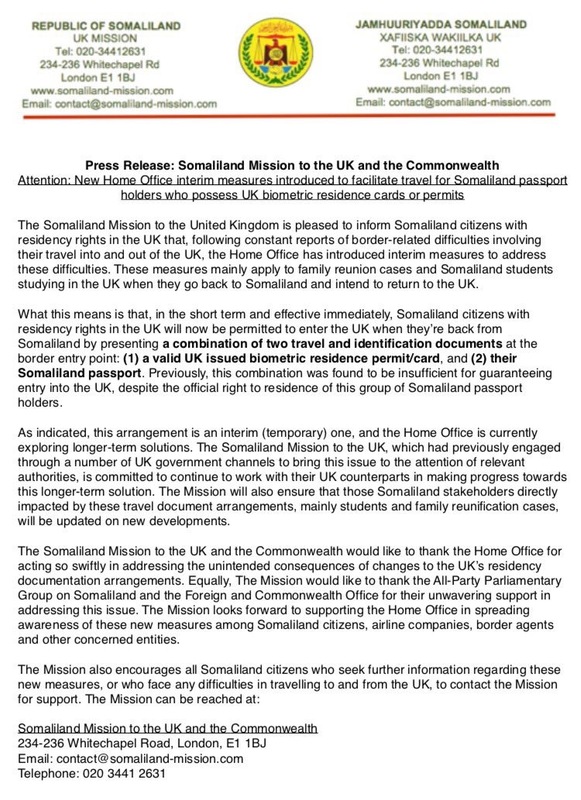 The Somaliland Mission to the UK,which had previously engaged through a number of UK government channels to bring this issue to the attention of relevant authorities,is committed to continue to work with their UK counterparts in making progress towards this longer-term solution.The Mission will also ensure that those Somaliland stakeholders directly impacted by these travel document arrangements ,mainly students and family reunification cases, will be updated on new developments. The Somaliland Mission to the UK and the Commonwealth would like to thank the Home Office for ac ting so swif tly in addressing the unintended consequences of changes to the UK’s residency documentation arrangements. Equally,The Mission would like to thank the All-Party Parliamentary Group on Somaliland and the Foreign and Commonwealth Office for their unwavering support in addressing this issue.The Mission looks forward to supporting the Home Off ice in spreading awareness of these new measures among Somaliland citizens,airline companies,border agents and other concerned entities.